Mihailo Petrov, poster for the first Zenit international exhibition, collage, 1924. Zenit: International Review of Arts and Culture was a Yugoslav avant-garde magazine published in 43 numbers in 34 volumes in Zagreb (Feb 1921-May 1923) and Belgrade (Jun 1923-Dec 1926). Its founder, editor and the chief ideologist of the Zenitist aesthetics Ljubomir Micić, a poet and art critic, was the main progenitor of the avant-garde in Croatia and Serbia during the first half of the 1920s. Cover of Zenit 4, May 1921. The magazine covered poetry, literature, fine arts, theatre, film, architecture, music. Special numbers were dedicated to young Czech artists (Nos. 7 and 8), and the new Russian art (No. 17-18 guest-edited by Ilya Ehrenburg and El Lissitzky). In its early days, Micić had the editorial cooperation of his brother Branko Ve Poljanski (Branislav Micić), Boško Tokin, and soon, the Expressionist poet Ivan Goll in Paris. Tokin and Goll fell off the masthead by 1922, and subsequently Micić and Poljanski provided the editorial leadership. The journal gathered poets and writers from the cities and cultural centres across Yugoslavia: Zagreb, Belgrade, Ljubljana, Novi Sad, Vinkovci, Sombor, Split and Zemun; it also established cooperation with Yugoslav authors then living in Prague (Dragan Aleksić), Paris (Rastko Petrović, Miloš Crnjanski, Dušan Matić) and Vienna (Zlatko Gorjan). Contributions from Russia and the West were often printed untranslated. Illustrations and reproductions of works by Jo Klek and Mihailo Petrov epitomized Zenitist art and painting. Zenit was in contact with other avant-garde reviews such as De Stijl, L'Esprit nouveau, Der Sturm and MaHer Oberzic. It had also published books; organized lectures, exhibitions, and soirees. After the last monthly issue of May 1923 it was published irregularly. Its format and design was changing with every few issues. The last issue (No. 4, Dec 1926) was banned for its putative advocacy of Bolshevism (through the involvement of Russian artists and M. Rasinov's article "Zenitism Through the Prism of Marxism" [Zenitizam kroz prizmu marksizma]); Micić fled across Italy to Paris. 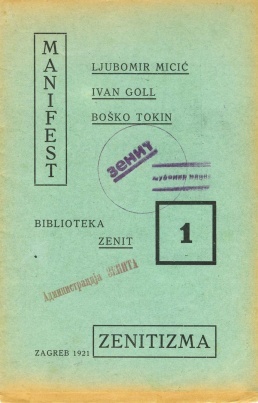 Micić, Goll and Tokin, Manifest Zenitizma [The Manifesto of Zenitism], Zagreb: Biblioteka Zenit, 1921, 16 pp. Printed as the first volume in the periodical's library. PDFs: 1, 2, 3, 4, 5, 6, 7, 8, 9, 10, 11, 12, 13, 14, 15, 16, 17-18, 19-20, 21, 22, 23, 24, 25, 26-33, 34, 35, 36, 37, 38, 39, 40, 41, 42, 43. All issues in ZIP. Scans in Digital National Library of Serbia. (Backup at Archive.org). Scans in World Digital Library. The monograph Zenit 1921-1926 published by Narodna biblioteka Srbije i Prosvjeta Zagreb in 2008 includes studies about literary and visual culture of Zenit, the complete chronicles of the periodical, biographies of all the contributors, a bibliography, a list of literature on Zenit and zenithism, as well as a valuable webography. The book was printed in full color, on 530 pages, and equipped with illustrations from the magazine, as well as with photographs of contemporary celebrities. Some of the photographs appear for the first time. The same year another reprint was published by Horetzky in Zagreb. Mihailo Petrov, Autoportret [Self-Portrait], 1921, printed 1971. Linocut. 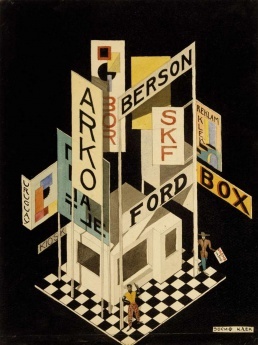 Jo Klek, Advertising Kiosk, 1923. Watercolor. Printed in Zenit 34 (1924). Mihailo Petrov, Kompozicija 77 [Composition 77], 1924. Gouache on paper. 31 x 23.5 cm. MSU Belgrade. This section is based on an 2008 essay by Irina Subotić. Most major European art movements of the early 1920s were reflected in Zenit. Following the initial clear orientation towards expressionism, the focus being on young, unrecognised artists, Zenitism practiced the ambivalent interpretation of dada, futurism and accepted the new wave of cubism. In its mature phase, Zenit introduced new, abstract art of varying orientation: from the activism and lyrical abstraction of Kandinsky, to various geometrical tendencies and constructivist movements – purism, neoplasticism, Bauhaus, especially constructivism, productionism, and functionalism. 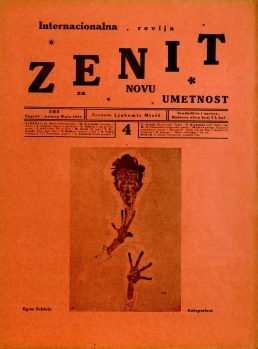 The first issues of Zenit - both the articles and reproductions – were characterised by expressionist individualism and artists who were critically disposed towards the bourgeois society of the early 20th century (Vilko Gecan, Egon Schiele, Rolf Henkl, Carry Hauser, Franz Bronstert, Jacoba van Heemskerk). But even though it was dominant, expressionism was not the only movement present in the initial phase of Zenit: very early on, cubism, futurism and dada featured on its pages. In his article "Pozorište u vazduhu" [Theatre in the Air], Boško Tokin pointed out the multidisciplinary experiments of the Italian futurist Fedele Azari, who looked at the airplane as an “extension of the body”, with dynamism and motion, pantomime, acrobatics, set design and urban spectacles, unconventional sounds and an anti-painterly way of using colour. Introducing the public to contemporary Paris exhibitions, Rastko Petrović presented the absence of sentimentalism and any narrativity in diverse variants of the then influential cubism, singling out the works of Ossipe Zadkine, Alexander Archipenko and Jacques Lipchitz – sculptors with whom Micić and Poljanski would immediately establish personal contacts. 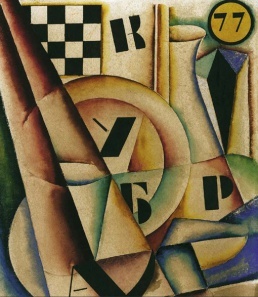 The French theoretician Florent Fels explained cubism as “a powerful means of creating a new aesthetics” and “a synthesis of space”, which Zenit underscored by printing reproductions of works by artists of various cubist orientations – A. Gleizes, L. Survage, R. Delaunay, and later P. Picasso, V. Foretić-Vis, O. Zadkine, J. Czáky and especially A. Archipenko. 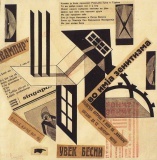 A poeticised variant of cubism was also advocated in Zenit by young Czech authors – poets, painters and architects gathered around Karel Teige and leftist revues - J. Havlíček, A. Wachsman, L. Süss, B. Piskač, A. Hoffmeister. Dada was given an important place in Zenit – both in the form of favourable presentation (the periodical published reproductions of works of Berlin dadaists George Grosz and Rodolf Schlichter) and with critical and ironic commentary. The presence of dada was the result of the socialising of Poljanski and Dragan Aleksić in Prague, the latter’s texts on Schwitters and on Tatlin, the meeting with Berlin dadaists, joint actions, matinees and evening events staged with collaborators in many Yugoslav cities. Micić expressed his programmatic principle concerning the changed nature of art, that is, nonrepresentional, abstract painting, in his reviews of exhibitions and in the theoretical article "Contemporary New and Surmised Painting", in which he abandoned the ideas of expressionism and argued in favour of art based on the principle of non-mimeticism, freedom of creation, the secondary place of form, the precedence of “the spiritual – abstract – absolute”, relying on the examples of Kandinsky, Chagall and Archipenko. Zenit affirmed the work of Hungarian leftist activists, led by Lajos Kassák. This meant approaching geometrical abstraction and constructivist tendencies as a collective act. At the same time, in the course of the year 1922, Russian avant-garde assumed concrete and applied forms in Zenit: the periodical reproduced Tatlin’s Draft of a Monument to the Third International, an utopian and visionary work of new technology and ideology, whereas Rodchenko’s kiosk became a meeting point of all zenitists in Micić’s zenitist radio-film "Шими на гробљу латинске четврти. Зенитистички радио-филм од 17 сочиненија" [Shimmy in the Graveyard at the Latin Quarter]. 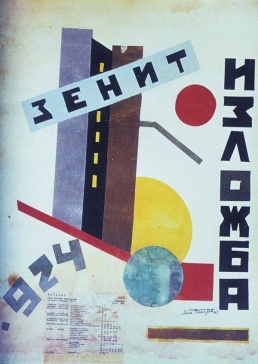 Owing to intensive cooperation with Ilya Ehrenburg and El Lissitzky, editors of the Veshch periodical and the most prominent representatives of the Russian Berlin, Zenit followed the phenomena of topical interest in Russia – public celebrations and urban spectacles, the adorning of ships, trains, streetcars, the squares and the streets of Moscow and St Petersburg, which strengthened Micić’s view that exhibitions had to have a social role, that is to say, they ought to be intended for the broadest circles of viewers. The peak of this editorial policy is The Russian Issue (no. 17-18), dedicated in its entirety to Russian avant-garde in all artistic disciplines. 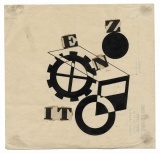 The issue was edited by Ilya Ehrenburg and El Lissitzky (the latter is the author of the cover design for this issue of Zenit, in the form of his project of the new – PROUN). There were echoes of Russian avant-garde in the Zenit criticism as well: Ve Poljanski wrote a text entitled "Kroz rusku izložbu u Berlinu" (Through the Russian Exhibition in Berlin), which A.B. Nakov considered to be, “on the basis on any criteria, among the most inspired and profound reviews of this exhibition”. Poljanski did not hide his elation over the revolution carried out by Russian avant-garde artists. 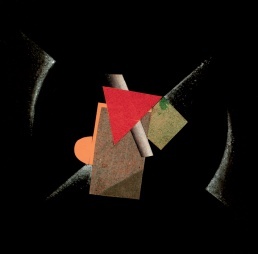 A certain balance in establishing relations between the East and the West was achieved in Zenit by following the concept of neoplasticism in Theo van Doesburg’s text "Volja ka stilu“ [Will to Style], which advocates the ideas of collectivism, logic, synthesis, energy, truth and purity. On the other hand, the apologia of the social influence of art and architecture – which became dominant during a later phase of Zenitism – was contributed to by Jozef Peeters’s "Катихизис пријатеља уметности" [A Catechesis of Friends of Art]: in the propaedeutic form of ten commandments, the text points out the idea of a social project in which geometrical abstraction would become a part of modern life. For a practical application of this concept, Zenit published works of objective abstraction – by Peeters, L. Lozowick, H. Behrens-Hangeler, and a joint collage by Micić and Jo Klek entitled In the Name of Zenitism. The functionalisation of such ideas had already been promoted on the pages of Zenit through the works of A.-P. Gallien, K. Teige, L. Kassák, L. Moholy-Nagy, El Lissitzky, A. Rodchenko, K. Malevich, M. S. Petrov, Jo Klek. Fitting in with the programme of the Balkanisation of Europe, in his text “Anti-social Art Should be Destroyed” Micić argued in favour of the internationalisation of all cultural values, underlined the importance of folk skills and gave preference to craft schools over museums – which he described as tombs and “the pantheons of idleness”. During a later phase, the periodical increasingly reprinted political caricatures as a substitute for classical fine arts works. They provided ironic comments at the expense of capitalism, the bourgeois society, the League of Nations, functioning in the same manner as Micić’s systematically fought battle with bureaucracy, the state administration, the police, the media and the like. Moreover, it was a declaration of war to the entire imperialist-capitalist, non-democratic world, made in a utopian hope that it was possible to build a new, different and better world. In absolute discontinuity with the Serbian graphic art of the time, Mihailo S. Petrov (“a new asset of ours”, as Zenit wrote) marked the first phase of Zenitism (1921) by his black-and-white linocuts programmatically provided for the pages of Zenit (numbers 6-13). Petrov, who later contributed to other avant-garde periodicals as well (Dada-Tank, Út), represents an example of a dual allegiance, to both expressionist and abstract art, close to Kandinsky. His linocuts, made in symbiosis with poetry, were especially valuable as such, being the first examples in Serbian and Yugoslav art. In the mature phase of Zenit (1923-1925), the most memorable mark of zenitist art was left by Josip Seissel (known in Zenitism under the pseudonyms Jo and Josif Klek). At international exhibitions in the 1920s (held in Belgrade, Bucharest, Bielefeld, Moscow), he represented Zenit, which published his collages, photomontages, architectural drafts, drawings, watercolours, temperas, sketches for theatre costumes and a curtain, advertisements, ex-libris etc. He was responsible for the graphic design and layout of some of Zenit’s editions (Effect on Defect and The Monkey Phenomenon by Marijan Mikac), and he was also the author of the Zenit exhibition poster. His abstract and multidisciplinary work was used by Micić to identify PAFAMA (Papier-Farben-Malerei, the Serbian version of which was ARBOS – (h)ARtija-BOja-Slika [paper-colour-picture]) as an authentic phenomenon of zenitist art. His work is characterised by narrativity, humour and irony of dadaist provenance. Relying on the constructivist principles of the valuation of materials and exploration of space, Klek became involved in non-representational art, quite exceptional in Croatian and Yugoslav art of the early 1920s. 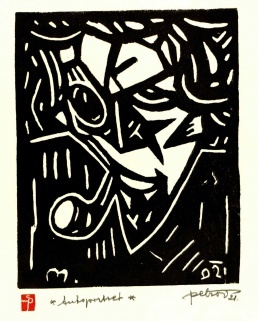 Autoportret [Self-Portrait], 1921, printed 1971. Linocut. Printed in Zenit 6 (1921). Današnji zvuk [The Sound of Today], 1921. Linocut. Printed in Zenit 6 (1921). 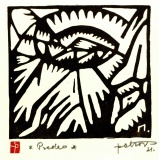 Predeo [Landscape], 1921, printed 1971. Linocut. Printed in Zenit 8 (1921). Ritam [Rhythm], 1921, printed 1971. Linocut. Printed in Zenit 10 (1921). Kompozicja II [Composition II], 1922, printed 1971. Linocut. Zenit [Zenith], 1922, printed 1971. Linocut. Printed in Zenit 13 (1922). Zacarani krugovi [Vicious Circle], 1922, printed 1971. Linocut. Mostovi [Bridges], 1922, printed 1971. Linocut. Designs for Le Théâtre zénitiste, 1923. Centre: stage curtain; left and right: costumes. Printed in Zenit 24 (1923). Advertising Kiosk, 1923. Watercolor. Printed in Zenit 34 (1924). Sketch for Zeniteum I, 1924. Printed in Zenit 35 (1924). Untitled. Collage. 18.6 x 14 cm. Sketch for Marijan Mikac's Efekt na defektu [Effect on Defect] book cover, 1923. Collage on paper. 19.2 x 20 cm. Cover of Marijan Mikac's Efekt na defektu [Effect on Defect], 1923, designed by Jo Klek. Untitled. Collage. 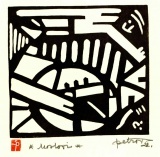 22.7 x 16 cm. Cover of Marijan Mikac's Fenomen majmun [Monkey Phenomenon], 1925, designed by Jo Klek. with Ljubomir Micic, Во имја зенитизма, 1924. Collage. Printed in Zenit 26-33 (1924). Pomozite studentima, Zagreb, 1924. Poster. Literatura o Zenitu i zenitizmu [Литературу о Зениту и зенитизму], in Golubović, Subotić, Zenit 1921-1926, Belgrade, 2008, pp 421-463. (1397 entries, 1921-2007). Splav meduze, dir. Karpo Acimovic-Godina, 1980. Zenit magazine at Monoskop Log. Zenit in Virtual Museum of Avant-Garde Art, Marinko Sudac Collection, Varazdin, Croatia. Poesia (1905-09, 1920), Der Sturm (1910-32), Blast (1914-15), The Egoist (1914-19), The Little Review (1914-29), 291 (1915-16), MA (1916-25), De Stijl (1917-20, 1921-32), Dada (1917-21), Noi (1917-25), 391 (1917-24), Zenit (1921-26), Broom (1921-24), Veshch/Gegenstand/Objet (1922), Die Form (1922, 1925-35), Contimporanul (1922-32), Secession (1922-24), Klaxon (1922-23), Merz (1923-32), LEF (1923-25), G (1923-26), Irradiador (1923), Sovremennaya architektura (1926-30), Novyi LEF (1927-29), ReD (1927-31), Close Up (1927-33), transition (1927-38). Entretiens politiques et littéraires (1890-93), Moderní revue (1894-1925), Volné směry (1897-1948), Mir iskusstva (1898-1904), Vesy (1904-09), Poesia (1905-09, 1920), Zolotoe runo (1906-10), The Mask (1908-29), Apollon (1909-17), Ukraïnska khata (1909-14), Der Sturm (1910-32), Thalia (1910-13), Rhythm (1911-13), Trudy i dni (1912), Simbolul (1912), The Glebe (1913-14), Ocharovannyi strannik (1913-16), Revolution (1913), Blast (1914-15), The Little Review (1914-29), Futuristy (1914), Zeit-Echo (1914-17), The Egoist (1914-19), L'Élan (1915-16), 291 (1915-16), Orpheu (1915), La Balza futurista (1915), MA (1916-25), SIC (1916-19), flamman (1916-21), The Blindman (1917), Nord-Sud (1917-18), De Stijl (1917-20, 1921-32), Dada (1917-21), Klingen (1917-20, 1942), Noi (1917-25), 391 (1917-24), Modernisme et compréhension (1917), Iskusstvo kommuny (1918-19), Formiści (1919-21), S4N (1919-25), La Cité (1919-35), Aujourd'hui (1919), Exlex (1919-20), L'Esprit nouveau (1920-25), Orfeus (1920-21), Action (1920-22), Proverbe (1920-22), Ça ira (1920-23), Zenit (1921-26), Kinofon (1921-22), Het Overzicht (1921-25), Jednodńuwka futurystuw (1921), Nowa sztuka (1921-22), Broom (1921-24), Život (1921-48), Creación (1921-24), Jar-Ptitza (1921-26), New York Dada (1921), Aventure (1921-22), Spolokhi (1921-23), Gargoyle (1921-22), Veshch/Gegenstand/Objet (1922), Kino-fot (1922-23), Le Coeur à barbe (1922), Die Form (1922, 1925-35), 7 Arts (1922-28), Manomètre (1922-28), Ultra (1922), Út (1922-25), Dada-Jok (1922), Dada Tank (1922), Dada Jazz (1922), Mécano (1922-23), Contimporanul (1922-32), Zwrotnica (1922-23, 1926-27), Secession (1922-24), Stavba (1922-38), Gostinitsa dlya puteshestvuyuschih v prekrasnom (1922-24), Putevi (1922-24), Klaxon (1922-23), Akasztott Ember (1922-23), MSS (1922-23), Perevoz Dada (1922-49), Egység (1922-24), L'Architecture vivante (1923-33), Merz (1923-32), LEF (1923-25), G (1923-26), The Next Call (1923-26), Russkoye iskusstvo (1923), Disk (1923-25), Irradiador (1923), Surréalisme (1924), Almanach Nowej Sztuki (1924-25), La Révolution surréaliste (1924-29), Blok (1924-26), Pásmo (1924-26), DAV (1924-37), Bulletin de l'Effort moderne (1924-27), ABC (1924-28), CAP (1924-28), Athena (1924-25), Punct (1924-25), 75HP (1924), Le Tour de Babel (1925), Periszkop (1925-26), Integral (1925-28), Praesens (1926, 1930), Sovremennaya architektura (1926-30), bauhaus (1926-31), Das neue Frankfurt (1926-31), L'Art cinématographique (1926-31), Dokumentum (1926-27), Kritisk Revy (1926-28), Novyi LEF (1927-29), i 10 (1927-29), Nova generatsiia (1927-30), ReD (1927-31), Dźwignia (1927-28), Tank (1927-28), Close Up (1927-33), Horizont (1927-32), transition (1927-38), Discontinuité (1928), Munka (1928-39), Quosego (1928-29), Urmuz (1928), Unu (1928-32), Revista de Antropofagia (1928-29), 50 u Evropi (1928-29), Documents (1929-30), L'Art Contemporain - Sztuka Współczesna (1929-30), Adam (1929-40), Art concret (1930), Zvěrokruh (1930), Alge (1930-31), Le Surréalisme au service de la révolution (1930-33), Levá fronta (1930-33), Kvart (1930-37, 1945-49), Nová Bratislava (1931-32), Linja (1931-33), Spektrum (1931-33), Nadrealizam danas i ovde (1931-32), Ulise (1932-33), Die neue Stadt (1932-33), Mouvement (1933), PLAN (1933-36), Karavan (1934-35), Ekran (1934), Axis (1935-37), Acéphale (1936-39), Telehor (1936), aka (1937-38), Plastique (1937-39), Plus (1938-39), Les Réverbères (1938-39). This page was last modified on 30 November 2018, at 14:01. This page has been accessed 38,732 times.